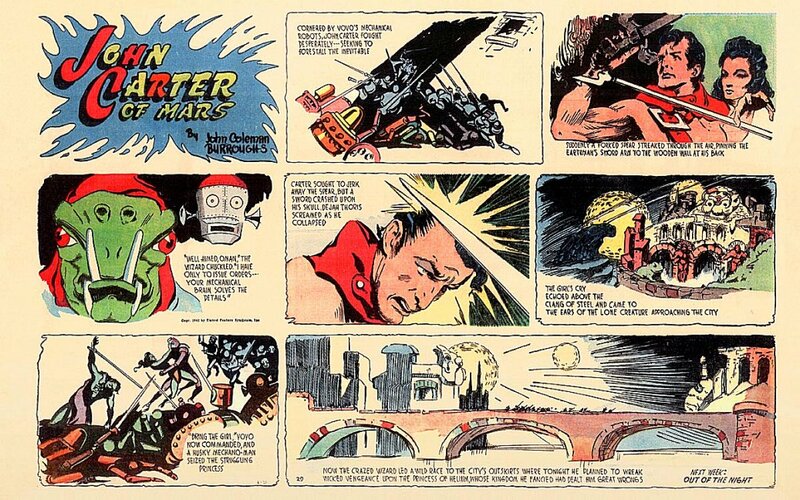 P1: Cornered by Vovo's mechanical robots, John Carter fought desperately -- seeking to forestall the inevitable. P2: Suddenly a forked spear streaked through the air, pinning the Earthman's sword arm to the wooden wall at his back. P3: "Well aimed, Oman," the wizard chuckled. "I have only to issue orders --- your mechanical brain solves the details." P4: Carter sought to jerk away the spear, but a sword crashed upon his skull. Dejah Thoris screamed as he collapsed. P5: The girl's cry echoed above the clang of steel and came to the ears of the lone creature approaching the city. P6: "Bring the girl," Vovo now commanded, and a husky mechano-man seized the struggling princess. P7: Now the crazed wizard led a wild race to the city's outskirts where tonight he planned to wreak wicked vengeance upon the Princess of Helium, whose kingdom he fancied had dealt him great wrongs. 1. Instead of casting his spear into the Earthman, Oman merely pins Carter's sword-arm to the wall with his missile. So, instead of killing Carter, the chief robot only disables him and he is soon rendered unconscious. This sequence, in the novelization, can be structured so as to emphasize Carter's lack of consciousness, further foreshadowing the possibility that all of the happenings in the story have now become a dream and not reality. 2. In the novelization, the subsequent events, up through those narrated on page #64, will all eventually be explained as having been one continual nightmare, shared by John Carter and Dejah Thoris, while at Eo. What seems to take place over many days will be explained as having taken only a few hours. During that dream-time, Oman overthrows Vovo and establishes himself as the leader of the robots. The robots watch over the unconscious humans until Oman is able to contact Sola and enlist her help in bringing them back to waking life. The robots carry the couple to the dead sea bottom at the foot of the plateau and there Sola waits for the Earthman and the princess to awaken. When they do so, they do not immediately realize that they have been jointly sharing the same dream, while lying unconscious in Vovo's lab. This denouement of the adventure will all be provided in the novelization's chps. 63-65. Until that point, the reader will be left to wonder is the story is "real" or "unreal" fiction. John Carter's long-sword cut empty space. The metal warriors were moving fast and furious to separate him from the princess. Dejah Thoris held the short sword in her hand. She knew well how to use it; but the situation was an impossible one. Her two strikes fell upon sturdy metal bodies, with no more effect than a tiny insect pestering a fur-encased orluk. Suddenly Oman's forked spear streaked through the air, pinning the Earthman's sword arm to a wooden door at his back. Carter pulled a dagger with his free hand and sought to jerk away the spear. But without warning a heavy metal hand crashed upon his skull. When a robot soldier removed the trident, the swordsman from another world sank to his knees, unconscious. The girl's shout echoed through the silent streets and came to the ears of the lone creature approaching the city. Woola had been moving slowly but the sound of a familiar voice spurred him to a run. Seconds later he caught the first faint scent of his master and the red princess. The brute broke out of the virgin forest and entered the fringes of Vovo's city, unexpected and undetected. All was quiet in the little city. To the watchdog the many buildings were just cliffs and caves; it did not occur to Woola to search the deserted city in any systematic way. Instead he followed his nose until he reached the spot where the scent was strongest. Most elevatable Martian buildings are lowered during the day and raised at night, but Vovo's tower operated on the opposite schedule. The metal building that guarded the skies during the day had been let down and in the moonlight Woola circled it again and again. The humans must have been there, his nose told him that. But where had they gone? The squad of mechano-men seized the Princess of Helium. For a moment she struggled, but their steel grips were unbreakable. They did not speak among themselves, but when she asked one of her captors where they were going, she received a curt answer. "Vovo commands that you be taken to his new experiment site within the ruins of the atmosphere plant." Dejah Thoris knew that any further questioning of the mindless androids would be useless. However, her curiosity immediately seized upon the odd statement made by the robot. He spoke of the "ruins of the atmosphere plant." There was something strange in that remark, the girl thought. If the great Atmosphere Plant lay in ruins, all the inhabitants of Mars would have been gasping for oxygen, before her body arrived at Eo. There must be some other answer. Scientists in the recent, ill-fated expedition she had accompanied discovered faint evidence of oxygen and nitrogen being introduced into the air near the North Pole, but that was very far from Eo. Could it be that the robots of Eo manufactured gasses to help restore Barsoom's dying skies? Oman stood over the unconscious form of the Jasoomian. He had watched the entire affair play itself out, from beginning to end. He himself had assisted in the decalcification of both of the humans. He had obeyed his master's every order, but when Master Vovo had commanded him to kill the Earthman, something inside of Oman's mental circuitry went awry. He had not followed that order explicitly and, as a result, the unconscious stranger had not been "disposed of." Master Vovo was temporarily away, beginning a new phase of his experiments. Vovo's orders were to kill man, but already his brain was forming new connections and Oman the robot was trying very hard to think like a human being. No, he would not destroy the helpless man -- he had another idea. Dejah Thoris saw that the metal men were taking her out of the city to some isolated spot in the jungle. At the head of the midnight excursion was the wizard, whom she thought of as a madman who acted with no clear motive. She knew nothing of his past and she had only the foggiest impression of how it was that her petrified body had come to rest in his laboratory. Nevertheless, the princess understood that the dwarf had only released her from the stony death in order to collect a huge ransom from Helium -- also that he had tried to buy the Jasoomian's loyalty with an offer of command over the conquering robot army he intended to muster. But now the crazed wizard was leading his mechano-men on a wild race beyond the city's outskirts, where he planned to wreak a wicked vengeance upon the royal family of Helium, whom he fancied had dealt him great wrongs. All of that she comprehended. But exactly what was to become of her, she had no idea. The princess feared for the life of Captain Carter and she winced at the thought of what Vovo's "vengeance" might entail. Oman realized that the key to unlocking the mystery that surrounded his thinking processes was the recovery of his memory. Many times he had assisted Vovo and Vo Dor in erasing robotic memories. Now if he could only determine how to un-erase a set of memories, or discard false memories! "What am I thinking?" Oman said. But the unconscious John Carter did not respond. "Who is Vo Dor?" he continued. "I ask myself that question but I see only the face of Vovo. My thinking is wrong here. I must disentangle the two names. When did I first learn of Vo Dor? Oh motionless Jasoomian, if only you would open your eyes. I know your human mind could help me!" Oman tried to approach the question differently. He asked himself when he had first seen the features that made up Vovo's countenance and the answer came -- ten years before Vo Dor arrived at Eo. So! they really were two different persons. The one who later called himself Vovo arrived first, then returned ten years later with another, named Vo Dor. And subsequently Vovo had tampered with Oman's brain, merging his recollection s of the two guests into a single false memory. But why? The metal men led the princess through the dense foliage and into a vast structure of great antiquity. The vast unlit chambers appeared to extend for long distances in every direction, but where the roof should have been she could see the nighttime stars. Here and there the interior walls had been partly torn down. The hulks of ancient machinery were everywhere and many of their dismantled components lay scattered across the floors. Before long the thought occurred to the girl that this hoary accumulation of broken architecture and abandoned equipment must be "ruins of the atmosphere plant" which had been previously mentioned to her. "So this is where Vovo takes his revenge upon Helium. What does he intend to do with me?" But the mechano-men could give the red princess no answers.